Prague is best explored on your feet. The narrow streets provide a nostalgic walk in the past. The streets have been walked on for hundreds of years - Prague streets are made for people not cars. On your feet it is easy to pop into a church, a museum or a cozy pub for a refreshing beer. Walking is great but it does not take long to tire. A full day of walking on uneven cobble streets and a march up to the Prague castle can leave you sitting on a bench massaging your aching feet. 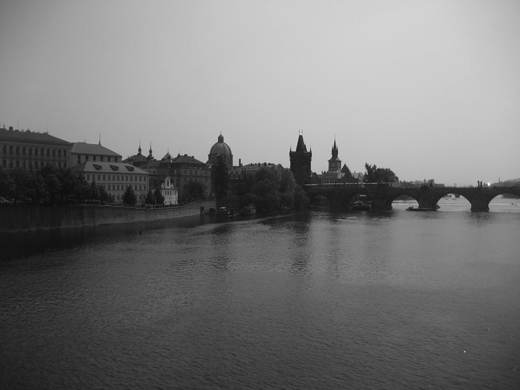 A wide river runs through the heart of Prague - the Vltava. It twists through the city like a backwards question mark. The 650 year old Charles Bridge spans across it connecting the Castle with the Old Town Square. If your ankles are bulging and your knees are about to buckle you can give them a well-deserved rest by enjoying a river cruise. A river cruise on the Vltava is neither a luxury line sea cruise nor a Huckleberry's raft trip down the Mississippi, but something in between. Prague boat cruises are a combination of a luxury craft and a natural open air raft. On hot summer days you sit on the deck, eat, drink and surround yourself with the sights and sounds of the old city as it slowly glides by. A two hour cruise will take you through the entire city and out into the country side. At a distance, from the vantage point of the river, the city and the land look as they did hundreds of years ago. From the river you do not hear the car horns, you do not see the McDonald's or the tourists - all you see is a beautiful city and the land around it. From the river you understand why Prague is called the Golden City. Regardless of the season or whether it is day or night, a river cruise is a pleasurable experience. In the winter you sit in a heated large windowed dining area. As you enjoy your warm meal and hot wine the city floats by you. At night the castle and ancient buildings light up – making for a surreal trip through medieval Europe. With Prague river cruises you have many options: two-hour trips, four-hour trips, lunches and dinners. And if you are feeling really adventurous you can even go on multi-day cruise.